One of the most heart wrenching consequences of the self inflicted wounds of several poor performing African States is the lack of access by the children to decent basic education. Few elites who can afford to send their children to private schools do so because the vast majority of the public schools are an eye sore. Many of the leaders of these failed and failing nations of sub-Saharan Africa devote all their energy to sharing the "national cake" derived, for example from fossil fuels, e.g. oil, and other natural resources. Rather than focusing on the "common good" for their populations, the leaders of these nations have presided over the meltdown of virtually all the social institutions in their nations. Arguably, the most heart-wrenching of the shenanigans of these woeful leaders is the total collapse of the educational systems in these nations. The pathetic state of public basic education in Nigeria is well known. In 2007, PACAW, Inc. was formed with the main goal of providing access to quality basic education to the children in the poor and most underserved villages. The program would start in Nigeria and then expand to other countries in the sub-continent depending on funding. 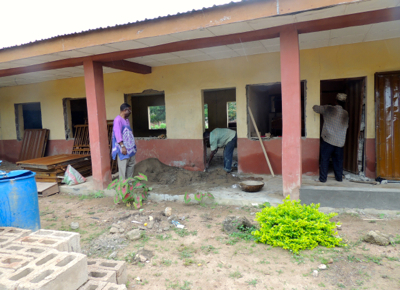 At the core, the PACAW, Inc. mode of operation is local community based and community driven development. The school teachers, Parent-Teacher-Association and community leaders decide what they need to provide decent basic education for the children. We partner with them to achieve their goals and also help them with capacity building. We strongly support quality early basic education, especially mathematics and science including computer science. In addition, we teach civics lessons beginning in primary six. We discuss some of the most fundamental questions in life that the sages, great thinkers, and great leaders of nations have pondered for millennia. What is the best kind of life ? What should be the purpose of my life and how should I lead it ? How can I contribute to society for the common good ? How can we achieve a good society ? We believe that this type of education is an indispensable foundation for the development of future generations of African leaders. It would lead to the transformation and renewal of their minds, so that they do not duplicate the feckless and oligarchic proclivities of many of their predecessors. Also, these children and young men and women, are reminded that the most important resources of their nations are not the oil fields, the gold, copper, silver, diamonds, tantalum, iron ore, coal or any other deposit buried in the ground. The most important and most abundant resources of Africa are the people, their brains, hundreds of millions of them. Hopefully, leaders from this pool will have the courage to champion freedom, liberty and justice in their nations, resulting in viable and sustainable development. PACAW, Inc. is fully aware of the fact that there are no easy answers to these very complex problems. We do not claim that ours is the only solution or indeed, the best solution. However, it should be absolutely clear to any informed observer of the African scene, that the prescriptions of the last several decades have, at best produced marginal results, and in several instances, have been fruitless. That something different has to be done need not even be debated. We at PACAW, Inc. are fully aware of the fact that there is no quick fix. It will take time. We undertake this endeavour with humility. The challenge is gargantuan, but we remain optimistic that there is hope for meaningful change. For now, the PACAW Inc. approach is a fresh start, and we believe it is a viable alternative which can, hopefully, turn around these poorly performing nations from their current disastrous path. 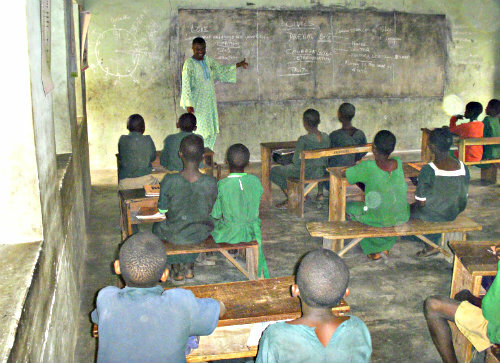 PACAW, Inc. President, Dr. Ayeni Teaching in Primary School in Kwara State, Nigeria, February 27, 2008.